The Japanese yen retreated after rising earlier today on risk aversion caused by bad news about Sino-US trade talks. Domestic macroeconomic data was mixed, giving the currency no direction. Markets started the session in a risk-off mode after a report that US President Donald Trump said that it is “highly unlikely” that he will meet with Chinese President Xi Jinping before the March 2 deadline for reaching a trade deal. That makes it less likely for the agreement to be achieved. The leaders of the world’s two biggest economies are still likely to meet afterwards. As for macroeconomic data, Japan’s Ministry of Health, Labour and Welfare reported that average cash earnings rose 1.8% in December from a year ago, whereas analysts had expected the same 1.7% rate of growth as in the previous month. The Statistics Bureau reported that household spending increased by just 0.1% versus the average forecast of a 0.8% increase. The report from the Bank of Japan showed that bank lending increased by 2.4% in January, year-over-year, the same as in December and matching expectations. The Ministry of Finance reported that the current account surplus rose to ¥1.56 trillion in December on a seasonally adjusted basis from ¥1.44 trillion in the previous month, exceeding the forecast value of ¥1.52 trillion. The Economy Watchers Survey released by the Cabinet Office showed a decline to 45.6 in January from 48.0 in December instead of an increase to 48.5 predicted by economists. USD/JPY traded about flat at 109.80 as of 11:51 GMT today after falling to 109.65 earlier. 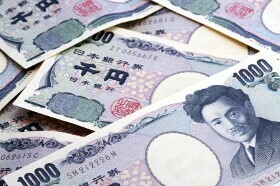 EUR/JPY was also flat at 124.56 following the drop to the low of 124.30. GBP/JPY actually gained from 142.18 to 142.35 after falling to the session low of 141.90 intraday.